Getting a mobile trailer wrap can be an exciting experience. From an ornate design process for personal trailers to the opportunities that open up for mobile businesses that utilize the service, SkinzWraps, Inc. is ready to share in your excitement. While planning a vinyl vehicle wrap may seem like a cut and dry process; it isn’t. This especially comes into play when preparing for a mobile vehicle wrap job. By following these five tips, you will be able to ensure that your mobile trailer comes out meeting your desired specifications. Before making the decision to wrap any vehicle, you need to know if the mobile trailer can be wrapped in the first place. The condition of the wrapping subject matters and some aspects of your vehicle can prevent the wrap from resulting in perfection. Issues like rust, scratches, and excess paint can all be features that hinder the completion of your wrap. 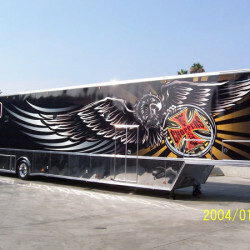 When you are ready to start the design process for your mobile trailer’s wrap, make sure that you walk in with a plan. Yes, part of this plan means having an effective design, but the main area that needs to be planned out is the measurements involved with the project. Walking into your local wrap specialist’s office with the exact dimensions that you need not only saves a lot of time on your job, but it could also save you money. Remember, that even wasted vinyl material on your project is material that you pay for. Measuring will mitigate this issue. If you are a mobile business like a food truck, you most likely have windows that you open up for service. It is a great idea to double-check your design and coverage before applying the wrap. For instance, you wouldn’t want your slogan or name of your business to be disfigured and unintelligible when your window is open during business hours. Don’t forget that consistency is key and your mobile trailer is most likely a larger wrapping subject, Making sure that your roof is also wrapped is a huge deal, especially if you are a mobile business advertising in the city. Throw your information on the roof, or add a graphic that will attract people in high-rises above you, down to your mobile business. Designing your mobile trailer wrap is the most personal aspect of the wrap process. Not only do you need this wrap to properly represent your business, but you also need it to appeal to every possible demographic. Attracting new customers is the whole point of this business move, so make sure that your mobile trailer stands out wherever it resides. When you decide to work with SkinzWraps, Inc. for your vinyl wrap job, remember that no vehicle is too large. Contact us today to find out about the many services we provide and how to schedule a consultation.